African Ringnecks look very similar to their cousins the Indian Ringnecks. African ring-necked parakeets are affectionate birds that needs enough attention to keep it from getting bored, but enough independence to spend time alone on a playgym. African ring-necked parakeets are shy and quieter than Indian ring-necked parakeets. They need to be handled and socialized often when young in order to keep them tame. African ring-necked parakeets enjoy bathing with their owners while staying on a shower perch to catch drops of water. They make good companions that can be taught to snuggle and perform elaborate tricks. 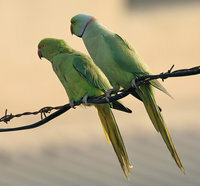 Indian Ringnecks are a vibrant green whereas the African Ringnecks are lime green. The black ring around the African Ringneck is more prominent than on the Indian Ringneck and much thicker toward the base of the beak. In addition, the African Ringneck’s black ring overshadows the signature rose-ring often seen in the Indian Ringneck. Unlike the Indian Ringneck who has a larger red beak, the African Ringneck has a smaller plum colored beak. The final and more obvious differences are their size and tail length. African Ringnecks are about the size of a cockatiel and their tails are much longer in respect to their bodies than the Indian Ringneck. Like the Indian Ringneck, they too have yellow feathers that underline their tails and wings. The African Ringneck is not as popular as their larger cousin the Indian Ringneck. They simply fell out of favor due to a lack of available mutations and because they were smaller in size. Unfortunately, many parrot breeders prefer the Indian Ringneck over the African Ringneck. Perhaps for this reason, there are so few African Ringnecks kept as pets. Those that do own an African Ringneck will find them to be marvelous creatures that bring a great deal of joy to their households. Most often these birds are collected in exclusive aviaries or parrot breeders who marvel over Asiatic parrots in general. These birds are slowly making their way into the pet industry due to their great disposition. African ring-necked parakeets enjoy a diet filled with fresh fruits, vegetables, pellets, parrot seed mixtures, cuttlebone and fresh water. Both the male and female are primarily light green with a greenish-yellow hue on the under parts. The male has a black stripe across the mandible that circles the neck and extends to its rose pink collar washed with a light blue. Male African ring-necked parakeets also have a light blue and thin black line across the beak and to the eyes. Females lack the rose pink collar, blue on the neck and the thin black mandible stripe. Instead of a black ring, found on the males, the females have a light green collar and only a hint of the black line leading to the eyes. African Ringnecks make wonderful pets if handfed and purchased just after weaning. Like the Alexandrine Parrot, African Ringnecks are much more docile compared to Indian Ringnecks. They are less aggressive and much easier to handle. They have a big parrot personality packed in a small body. They will gladly sit on their owner’s shoulder and enjoy being out of their cage. These smaller-sized parrots enjoy being petted alongside their neck; however, they are not too keen on being petted throughout their bodies. Like most Asiatic parrots, African Ringnecks would much rather interact with their owners than be cuddled, none the less, they do form strong bonds. Most tamed African Ringnecks enjoy human handling and will thrive for this type of interaction. If the African Ringneck was not handfed, take precaution when handling them as they can bite hard. Taming the parrot should be done with positive reinforcement and a gentile approach. This process may take some time but it is well worth the effort. Your parrot’s cage needs to be larger than a cockatiel cage. These parrots have long tails and need to climb and play with plenty of room. A good rule of thumb when shopping for a cage is to make sure the parrot can turn around, hang upside down, and flap its wings without touching the cage bars. A good spacious cage will allow plenty of room for toys, food/water bowls, and your hands. It is important the bars do not have large gaps as a curious parrot can either escape or get its head stuck. The cage should be easy to clean and food and water bowls should not be placed under the parrot’s perch. If extra room is available inside the cage, adding a few extra perches with different diameters will allow the parrot to exercise its feet. The cage should have a grill affixed inside the bottom of the cage to prevent access to contaminated food and the bird’s droppings. Pet ringnecks need a great deal of toys and mental stimulation to remain happy and healthy. Having a play stand with toys is essential for these birds. African Ringnecks do not chew as much as their larger cousins so mirrors, beads, and small wooden toys are ideal. Ropes for climbing and swings are also enjoyed. Never overfill the cage with too many toys and always rotate them to keep the parrot simulated and interested. Hiding a few treats throughout the parrot’s cage (for foraging) is wonderful and a fun way to stimulate the bird’s mind. All the bird’s toys should be placed above any perches to avoid becoming pooped on. If your parrot is fearful of a new toy do not place it inside the cage. Instead, gradually introduce the toy to your African Ringneck. Many owners will place a new toy across the room and will daily inch it towards the cage. Adding treats around the new toy will most likely cause the parrot to investigate the new object. This daily exposure is a great way to introduce new objects without frightening the bird. A well socialized African Ringneck will enjoy a variety of foods. A healthy diet consists of pellets, seeds, fruits, and vegetables. These parrots enjoy steamed carrots, pumpkin, or corn. Fruits and vegetables can be cut into cubes throughout the week and placed into the refrigerator for safekeeping. Small cuts of protein can be given to the parrot on occasion. Protein foods such a chicken, beef, or cooked eggs can be given to the parrot but must be removed after a few hours to avoid spoilage. These protein items must be given minimally and should never be the sole base of the diet. Food items to avoid are avocado, fruit seeds, onions, chocolate, and alcohol. These items could result in death. Unlike their larger cousins, African Ringnecks are much more prone to only eating seeds if given the chance. Many owners will gradually have to mix in new foods with their seeds to slowly get them accustomed to a varied diet. If this is the case, never just remove the seeds for a picky ringneck. Most African Ringnecks will starve to death and will refuse to eat it if they do not recognize the new food item. If a proper diet is given to the parrot from the beginning, and the bird is taken to the vet regularly, most African Ringnecks can live happily for 20 or more years. Some birds have been reported to reach the rightful age of 28. Breeding African Ringnecks seems to be a bit more challenging than breeding Alexandrine Parakeets or Indian Ringnecks as they tend to be a bit more finicky about their nesting locations and inspections. They need a bit more privacy as they become scared easily and will flutter around the aviary. The bird’s nesting box should be placed high enough to allow the pair to feel secure about their nesting site and the breeder should have easy access to the box. Whistling before entering the aviary is a good idea as this will alert the parrots upon the breeder’s entry. Their breeding cage should be as large as the breeder can afford and should be big enough to allow the ringnecks ample room to fly when not in a breeding mode. Using smaller wire to protect the birds is ideal as rodents and other critters can easily make their way into the enclosure if not secured. A good breeding cage is usually around six feet in length, four feet in width, and eight feet in height. Just before the breeding season begins the male will become vocal and start to display himself to the female. He will start to bow, pin his eyes, and open his wings and tail feathers while making courting calls. The female will become more responsive to the male by becoming more affectionate. They will start to feed each other and preen each other as the days continue. During this time many breeders will observe their females inside the nesting box scratching around. Pine shavings should be added into the nesting box before the season begins. Throughout this scratching phase, the female might remove the wood shaving placed inside her box by the breeder. Simply replace a handful of wood shaving until the box is padded again. It is important the shaving be about an inch thick as too much can easily result in the eggs getting buried during incubation. If the conditions are right for the parrots and they have bonded, the pair will mate and eggs can be expected around one to two weeks later. The female will produce between two and five white eggs. Incubation of the eggs lasts 23 days. The mother African Ringneck will stay with her babies until the chicks start to grow their feathers. As the food demand increases, she will leave the nest and help the father feed the babies until the babies fledge (leave the nest). The babies will wean around 10 weeks; however, if they are pulled for hand feeding, they should be removed when the oldest chick is at least 15 days old. Babies who wean with their mothers will do so more quickly than those handfed by humans. A handfed baby can take as long as 13 weeks.